Apricots are in season so I might have gone a little overboard buying apricots lately if you can actually do that! 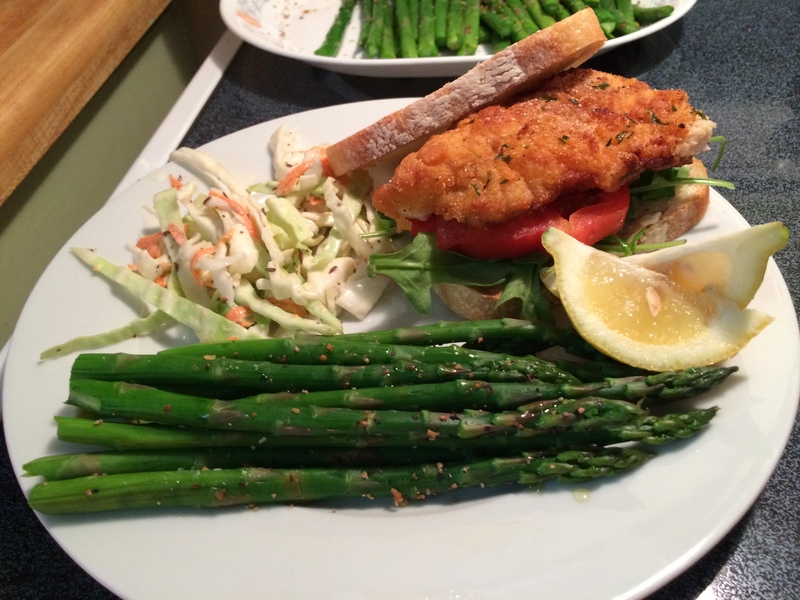 For this recipe, click on the link below. This salad is so simple and so flavorful, it’s my favorite and if you love all kinds of salads, you’ll love this one. 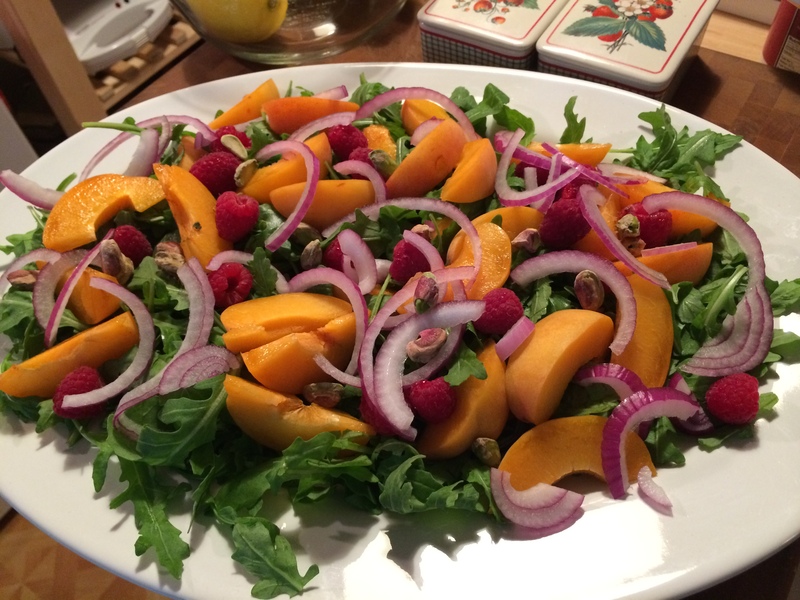 Just place some arugula, thinly sliced red onion, some fresh apricots. A few raspberries, and finally some pistachios for crunch. The colors are vibrant and the textures are vast, and that’s what makes a great salad. In a measuring cup, or small jelly jar with a lid add 1 tablespoon of Agave nectar, 4 tablespoons or 1/4 cup of fresh lemon juice ( 3 lemons) 1 tablespoon of Dijon mustard, 1 teaspoon of Kosher salt and 1/2 a teaspoon of black pepper. Whisk all this together really well and then start to drizzle in the E.V.O.O about 1/2 a cup ( I like 1 part acid 2 parts oil) while you’re continuously whisking. You’ll see the dressing come together. That’s all there is to it. Spoon the dressing on and enjoy. Whenever I’m craving Cole slaw, I like to make it compliment the dish I’m having it with. In this case it’s going along side my spicy cornmeal breaded Catfish. 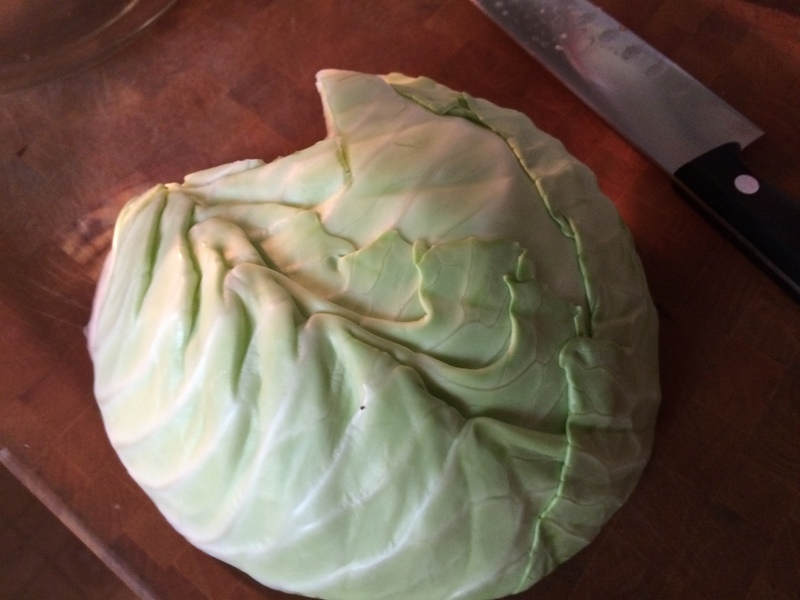 To start, I slice 1 whole head of green cabbage very thinly and shred my carrots around 1/4 cup. Because I’m changing this slaw up, I’m going to add about a cup of golden raisins, for that extra sweetness. I guess I should start with the dressing now. At this point I have the cabbage and carrots ready and waiting in a separate bowl. So let’s get the ingredients together for this terrific slaw. So in this bowl I put 1 1/2 cups of good mayo, to that I add 1/4 cup of granulated sugar, and 1/4 cup of whole milk. I then add the apple cider vinegar. 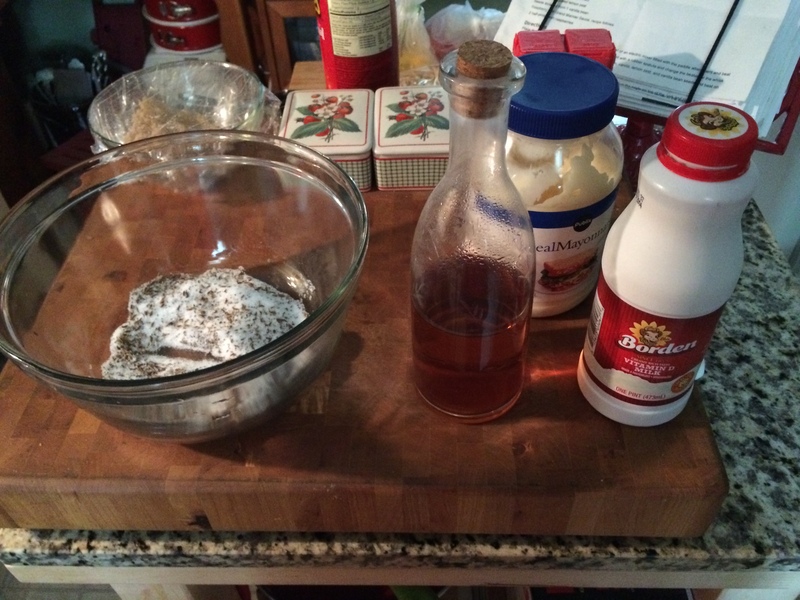 4 tablespoons, then I whisk all this together . Now for the spices. 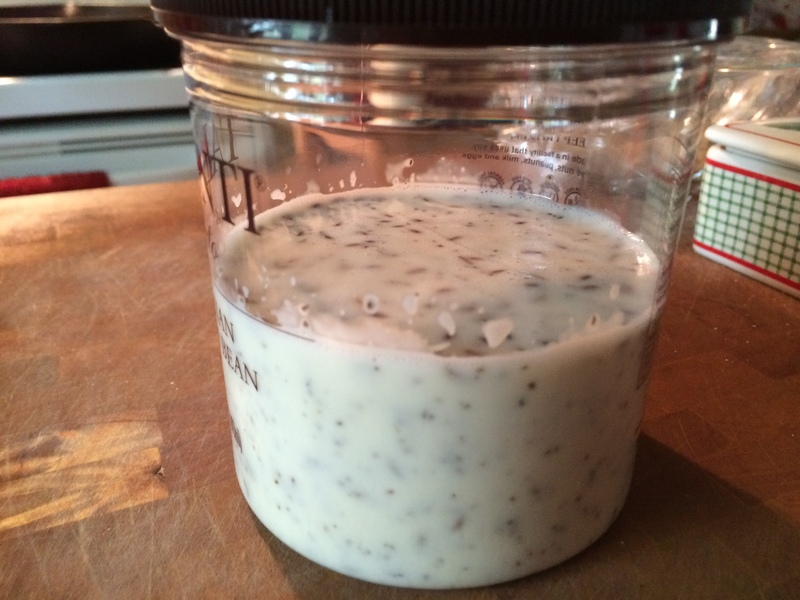 I put in 2 tablespoons of caraway seeds, 1 teaspoon of celery seed, and 2 tablespoons of ground cumin. At this point is when I add my salt and pepper. 1/2 a teaspoon of Kosher salt, and a couple of pinches of black pepper. I always taste it here in case I need to adjust for the seasoning, but after making this recipe for Steve so many times, this is pretty much right on the money. So now I transfer the dressing into a jar until I’m ready to dress the cabbage. I do this because If you dress it too early, it doesn’t have that crunch factor that I love, plus you can take the amount of cabbage out that your going to serve at that time, and just spoon on a few tablespoons of the dressing on it. 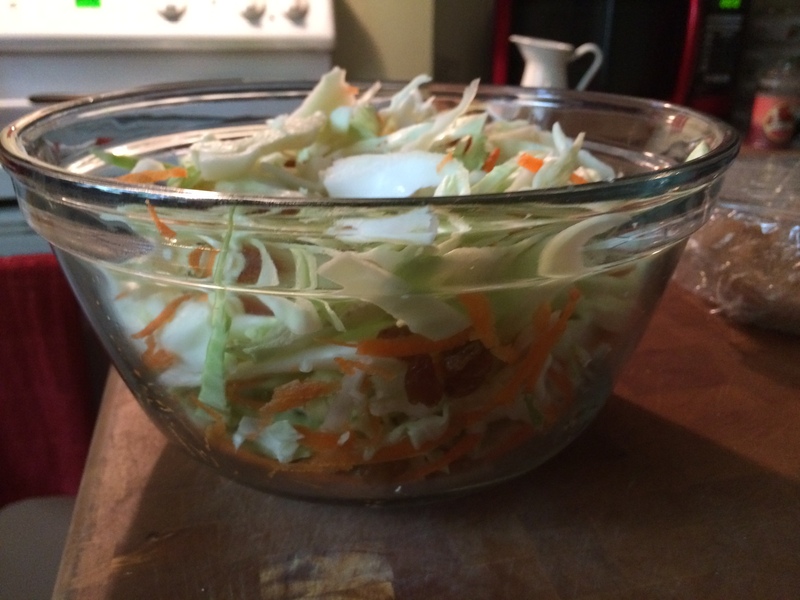 Toss them together let sit for just a minute and you will have the perfect slaw every time. When you spoon it along side your dish, it will look like you just made it when you really made it all in advance.